If you are looking for some low budget but exotic holidays this could be an interesting deal for you. Cape Verde archipelago can be found in Atlantic ocean west of African coast. You may currently book very cheap last minute flights from the UK (London, Manchester, Birmingham, Bristol) to Cape Verde (Boa Vista, Sal) already for £169! Flying to this exotic destination is great any time of the year. Even if its out of main tourist season at Cape Verde its not cold there by any means. Even in winter the temperature rarely drops below 20 degree Celsius. Ocean temperature usually floats around comfortable 23 degree Celsius. But Cape Verde has much more to offer than classic beach destinations..
TUI Airways UK offer cheap roundtrip flights to Cape Verde (when departing from Manchester, Bristol, Birmingham or London Gatwick). This is a last minute offer available mainly in February 2019. Air tickets are currently available already for £169. Please bear in mind that 5kg hand luggage is included in base fare only. If you would need checked in luggage you would have to add £50 for up to 20kgs checked in luggage. Please refer to below booking samples if interested in this deal. 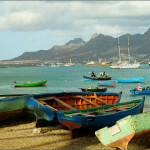 Booking sample of cheap flights from the UK to Cape Verde from £169! In this case you would be departing from London Gatwick to Sal on 21st of February and returning from Cape Verde back to the UK on 7th of March 2019.